Last month, M&C Saatchi gave its new senior leadership team a 30 per cent stake in the business. But does ownership drive financial performance? The accountancy firm Kingston Smith dug through the data and discovered that independent agencies that make their leadership team feel like owners, by giving them a stake in the company, substantially outperform the market. One of the best ways to encourage entrepreneurialism in a creative business is to give the people who drive it a direct stake. Last month, M&C Saatchi sold a 30 per cent stake in its London advertising agency to its management team because "when the management team takes ownership, the agency’s performance improves". M&C Saatchi is not alone in adopting this approach to drive entrepreneurialism through the business. Every independent agency is owned and driven by its management because, and rightly so, they have at some point spent sleepless nights thinking about its performance. The challenge is greater for larger agencies and plcs that need to replicate this focus beyond the founders and across the business. There are numerous benefits in allowing management ownership in the business they actually run. They become genuine co-owners and, when dividends are paid, they receive their fair share. Conversely, if performance does not merit a dividend, there is an instant and direct result for them. Paying for shares also brings about an increased focus, particularly if there is an opportunity for a capital reward on the eventual sale of those shares when it’s time to move on. The price of shares is usually calculated by multiplying profits by an appropriate number (often between four and eight); realising a capital gain on sale of shares can be very tax-efficient, so there is every incentive to drive profitability and growth. 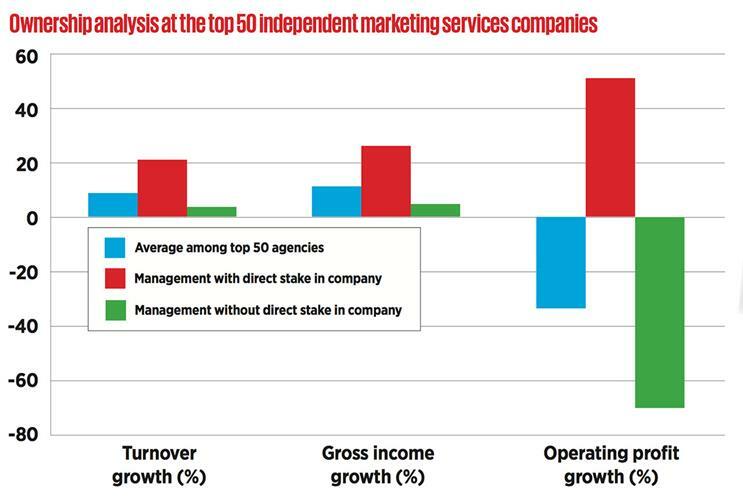 Eleven of the top 50 independent marketing services companies have subsidiaries with a substantial minority stake held by the people who run those subsidiaries, and this is particularly prevalent in the larger independents. These include Writtle, whose six subsidiaries are part-owned by their management, in-cluding the product design-ers Seymourpowell and the packaging specialist Williams Murray Hamm; The & Partnership has two subsidiaries with substantial minorities owned by their management teams; Emerge, AKA Group, Freuds Communications, Leagas Delaney, HPS Group, Four Communications and Oliver are also among those where management owns a substantial minority. The strategy works. The groups that have offered a direct stake in an operating subsidiary are more profitable and grow faster. Whether it is because they backed start-ups, deliberately left a stake in the hands of the management team of an acquired business or let the management team buy in, it’s clear that it is a reasonably common and successful strategy in private groups. Increasingly acquisitive groups such as MDC Partners leave a direct stake in the hands of the sellers. We have seen this occur in a number of transactions on which we have advised and it is becoming an increasingly popular structure. Where independence and a feeling of ownership are important, a majority has been left with management shareholders. WPP bought just 49.9 per cent of what has become The & Partnership and, previously, Publicis Groupe bought less than 50 per cent of Freud. Additionally, Leo Burnett bought less than 50 per cent of Bartle Bogle Hegarty in 1997. For public groups, it is harder to find incentives that really work, particularly for the management teams in subsidiaries. In addition to salary and benefits, listed groups tend to provide a combination of cash bonus and the award of either share options or shares. Often, the award of these incentives is based on the performance of the group’s share price or earnings per share relative to a basket of its listed peers. This prevents paying out or not based on swings due purely to a movement in the market. These equity-based rewards are a fundamental part of executive incentive plans but can a tiny percentage of a large quoted marketing group, the performance of which you can’t influence, really make you feel real ownership? It seems unlikely. When a private company does well, the owners know that every pound they add to profit enhances their potential dividend and adds to capital value. There is real entrepreneurial incentive in having a direct influence on the growth in the capital owned in a business. In a large public company, there is no such clear correlation. In the worst-case scenario where a public company suffers a loss in a recession and results plummet, the incentive schemes are designed so that if the one an executive works for falls by less than the basket against which they are measured, long-term incentive remuneration is still paid. In a private company, the founders would probably dock their own salary to safeguard the company. In October 2015, WPP’s Scholz & Friends introduced a management participation programme, combining substantial entrepreneurial elements with a new structure. Fourteen partners invested personally, as did an extended circle of about 25 executives. With this came a new approach: one company, one board of equal partners, one P&L – tearing down all walls between disciplines, units and locations. We now operate as a single company and share compensation. From the equality of partners stems a new all for one, one for all spirit. It made us all entrepreneurs together: the more we collaborate, the more efficient we are – and the better and more impartial clients are served. Management participation strengthened the independence of the agency brand. With the new model, Scholz & Friends is combining the advantages of a strong, entrepreneurial creative agency with the global power and resources of WPP. This creates an advantage for attracting and retaining the best talent and clients in the market. And, so far, the team approach has paid off – we already see a positive impact on collaboration, culture, business and profitability.